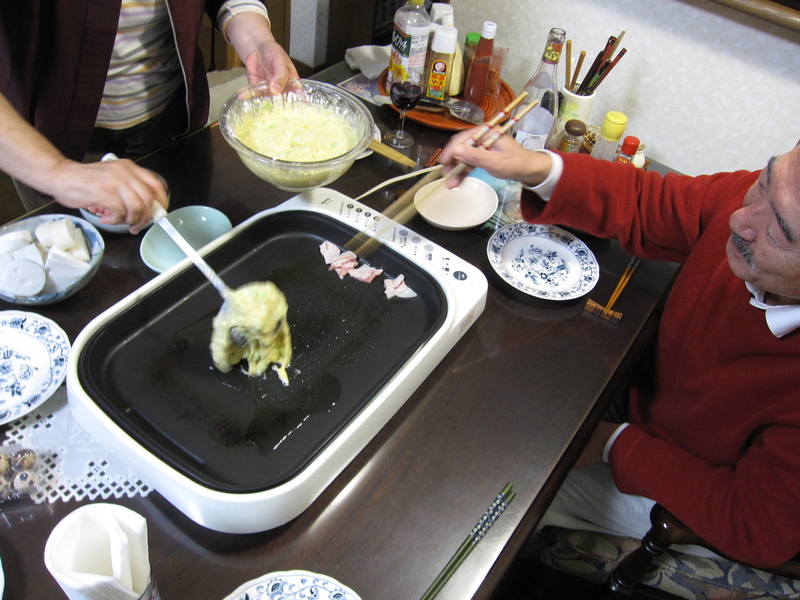 Alright, here’s Uichiro’s famous Kawabata-style Okonomiyaki. 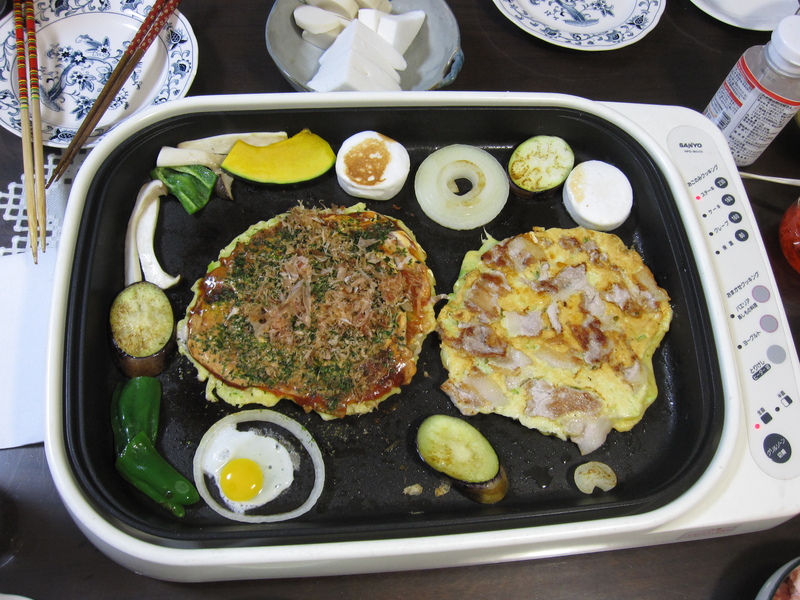 Okonomiyaki is Japan’s version of a pancake of sorts. It’s base ingredients are eggs, flour, and shredded cabbage. Not entirely sure if Uichiro uses water or dashi, or what else he puts in his mix (highly guarded secret but I’m sure there are green onions in it) but it sure is tasty. You start off by getting out the old table-top griddle. Once its hot add a little oil and pour some of the batter to form a pancake. Next to it lay out some sliced pork and start cooking it a little. Once the batter starts to cook lay the pork slices on top. 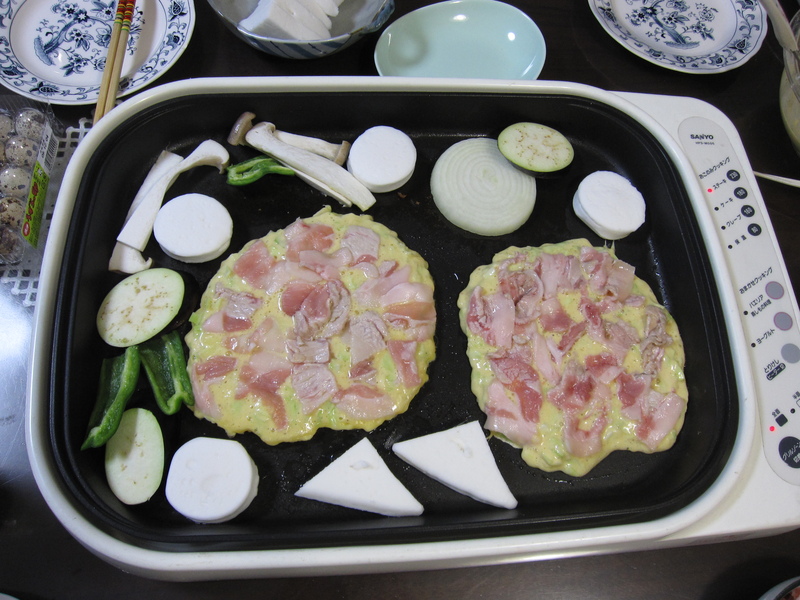 While the okonomiyaki cooks grill various veggies. 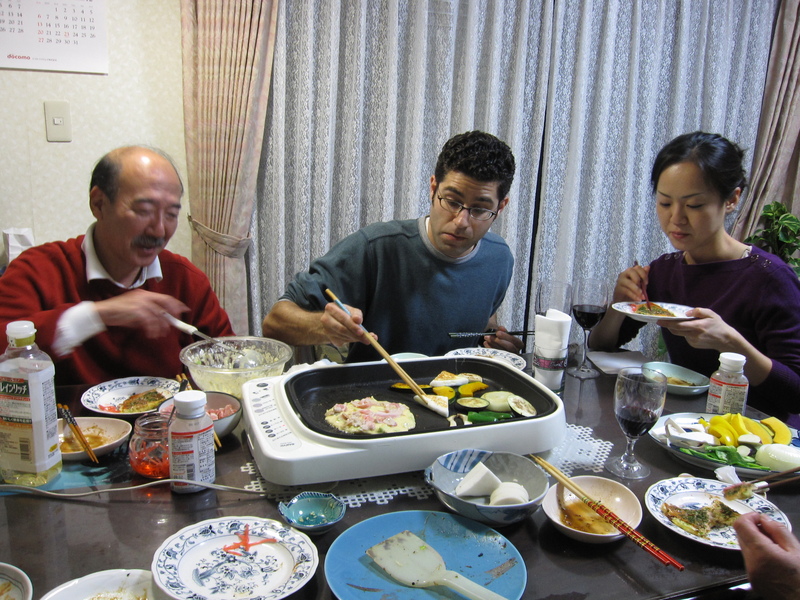 We had eggplant, green peppers, onion rings with quail eggs, kabocha, matsutake mushrooms, and various mochi cakes. 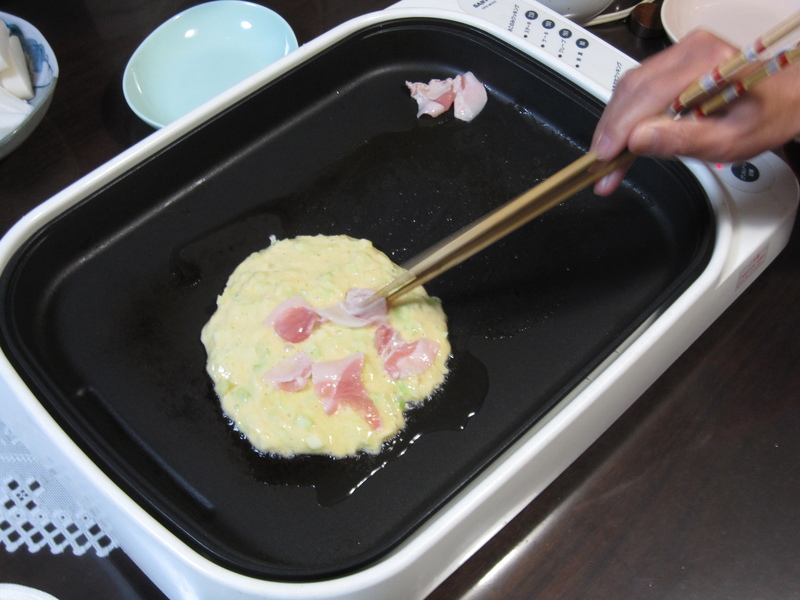 Once the bottom is done you carefully flip the okonomiyaki to cook the other side. Once it’s fully cooked spoon on top some bull dog sauce (a semi-sweet vegetable and fruit sauce), mayonnaise, shredded ao nori, bonito flakes, and pickled ginger on the side. Since it’s family-style you just cook and grab as you go. It’s a ton of fun and extremely tasty. And if you aren’t full yet, don’t worry as yakisoba is up next. 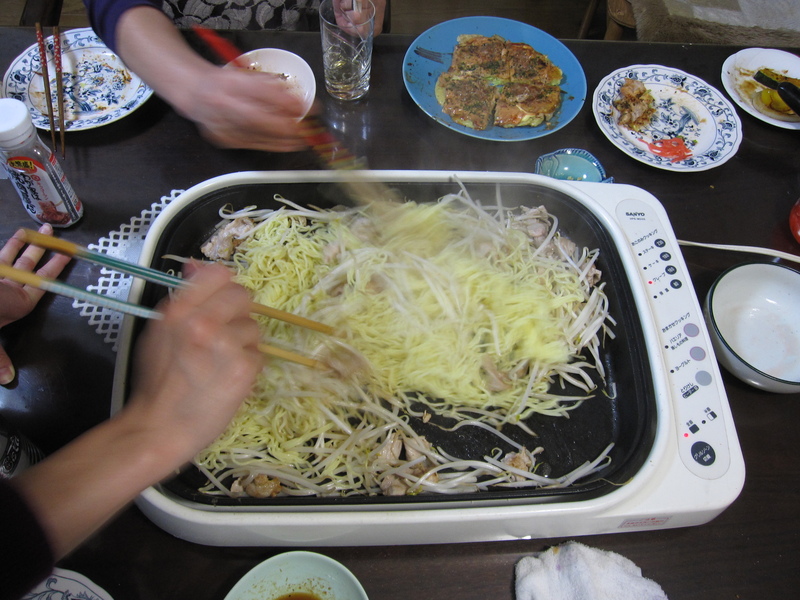 Once the batter is finished cook up the rest of the pork and veggies, add some bean sprouts and noodles, then eat it up.